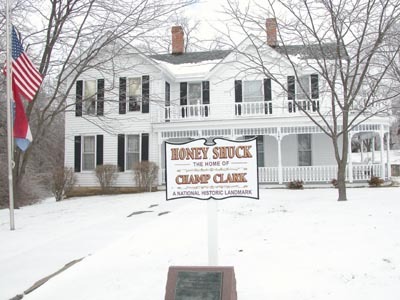 Contributions are the lifeblood that enable us to succeed in our mission to commemorate the political history of Missouri's favorite son, Champ Clark, and other Northeast Missouri politicians. Please contact us by by telephone at 573-324-6707 or 573-324-3154, or indicate your interest in donating through e-mail, using the "Contact Us" link. Thanks to the generosity of our founder, the late Hon. Bill Hungate, and his wife Dottie, donations you make will receive a dollar for dollar match from a fund established by the Hungates. Your generous contributions to our efforts will automatically have double impact. We are always searching for Champ Clark-related items. Please use the contact information reflected above to let us know you are interested in contributing in this way. We are a Section 501(c)(3) entity.